Advent is a season of waiting: we all know that, particularly by now as we draw near to the end of Advent and anticipate the joy of Christmas. The one we are waiting for is almost here! And as the angels proclaimed: that is good news which brings glory to God and peace on earth to those on whom His favour rests. Yet how does this peace come? What will bring about the shalom – the putting-back-everything-in-its-place order – of this world? Well, it comes through our calling, and God’s faithfulness. Our calling to be witnesses of the gospel: which is, in its simplest form, the good news about Jesus Christ. The Lord of all creation is no stranger to humanity, no distant deity, no angry tyrant or passively sentimental grandfather. No, He is the promised one, the hope of Israel, and the true picture of God Himself. Our calling is to tell His story: the good news that Jesus is our Saviour, Teacher, Lord and Friend. When we tell the story of Jesus, God is right there with us actively working to bring about faith: an ever-increasing trust that the story of Jesus is true, and an ever-increasing allegiance to Jesus as Saviour and Lord, that soon leads to an ever-increasing intimacy with Him as our Teacher and Friend. This maturing faith results in faithfulness: they are two sides of the same coin. Faith and faithfulness is none other than trusting obedience. Nothing is more natural for a follower of Jesus than obedience, since we not only love Him, but trust Him. Our obedience of faith was where this great redemption project of God’s was heading all along. So this Christmas, as we joyfully celebrate the birth of Christ, consider again the goodness of faithfulness, and the peace it brings. And give glory to God for it: for all the ways peace has come, in large ways and small. Yes, there is still much about this world and our lives that is not in peace: that longing for shalom, for salvation, and for justice is central to Advent itself. We are still waiting. But in the meantime, let’s not lose sight of the peace that comes through our obedience: the addictions and idolatries we have turned away from, the gifts we have received and shared, the blessings we gave in response to evil, and the forgiveness we offered that led to reconciliation. It is very likely that much of this peace is evident around you this Christmas – not perfectly, and not completely – but present nonetheless. May you be given eyes to see and celebrate the many ways in which your faithful obedience to Jesus, and the obedience of your sisters and brothers in Christ, has brought a measure of shalom to this world. “Now then, tell my servant David, ‘This is what the Lord Almighty says: I took you from the pasture, from tending the flock, and appointed you ruler over my people Israel. I have been with you wherever you have gone, and I have cut off all your enemies from before you. Now I will make your name great, like the names of the greatest men on earth. And I will provide a place for my people Israel and will plant them so that they can have a home of their own and no longer be disturbed. Wicked people will not oppress them anymore, as they did at the beginning and have done ever since the time I appointed leaders over my people Israel. I will also give you rest from all your enemies. Home. Such a simple yet complex word. Is it the dwelling you live in? Is it where your family is? Is it a familiar setting? Is it a place of origin? What if I don’t have a solitary answer for any of these? So…where is my home? This is a question I’ve pondered for most of my life and there is really no answer for this. 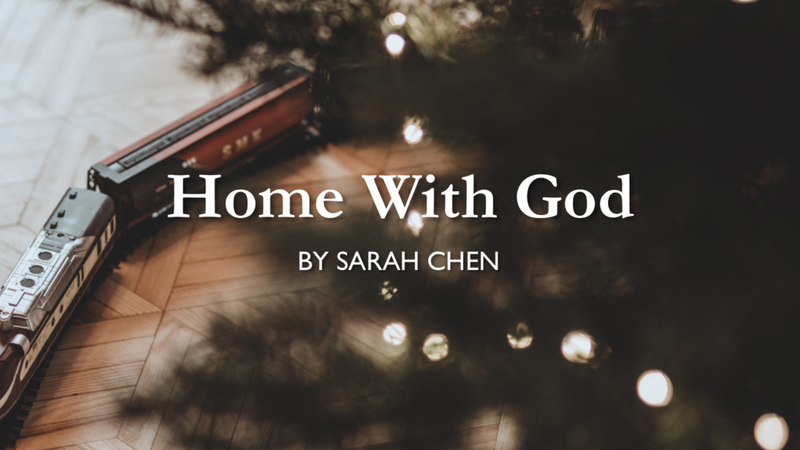 But home isn’t just about the ‘where.’ It’s also about the ‘who.’ And that in itself can also bring along a source of confusion, pain, and suffering. Wherever you are coming from on this spectrum, you’re not alone. All of our earthly homes, physical or relational, are limited in its provision and can never fully satisfy us, no matter how great they are. I know that my family will never be perfect. There will always be situations that are painful and hurtful - not that this gives me an excuse to slack off in my relationships. I’ll probably never fully feel at home in any given location. In 2 Samuel 7:1-11, God tells David that He has been moving place to place along with the Israelites. He promises David that He will provide a place for Israel, and will plant them so that they can have a home of their own. The Lord Himself will establish a house for David and the Israelites. This is a magnificent promise. What an honour it is to receive such a gift from God. As we get closer to Christmas, the birth of Christ this Advent, we, as gentiles have also been invited to a home that has been established by God through Christ. In the same way that God has moved with the Israelites, He has also been with us everywhere we have gone and will go. God is both watching us and protecting us. This brings me great comfort. To know that when our earthly homes are confusing and mixed up, we still have one home to turn to that is steadfast, and is more than anything our earthly homes can provide. However, being a part of God’s home is not just a lofty idea that exists only in the heavenly realm. We are currently united with each other as brothers and sisters of Christ. We are all part of God’s family and collectively a part of God’s home together. The thing about home, is that it is not a passive relationship. In a ‘healthy’ family, children obey their parents, not out of fear but out of reverence. Parents who are more mature, older, and wiser know what’s best for their children. It is a two-way relationship. An example that my parents love to use to explain this is one of a small child and a stovetop. A child cannot see the top of a stove, but the child’s parents can. When the child is told not to touch the top of a stove, the child listens because of their trust in their parents. When the child grows older, they will see and understand why they were told not to touch the hot stovetop. Of course, our earthly families will never be perfectly healthy. We’re all a bit dysfunctional. However, through Christ, we have access to a holy and perfect Father. In that same vein, being a part of God’s home is also a call to obedience. We put our trust in the Father, and through our trust in Him, we flourish. We will not get burned by that hot stovetop. As we mature, God reveals parts of Himself to us, and we understand more. Our faith and love for Him grows. This is the relationship that God has invited us into, and the home that we have been adopted into. As this Advent season closes, I invite you to join me in receiving God’s invitation into His home and family. Sarah is the Admin/Communications Coordinator or otherwise known as the person that lives in the office, soon to be moving out of the office. You can apply for her job here! Things she loves doing are reading books, cafe-hopping, and eating Asian food. You are more than welcome to join her on any of these escapades. 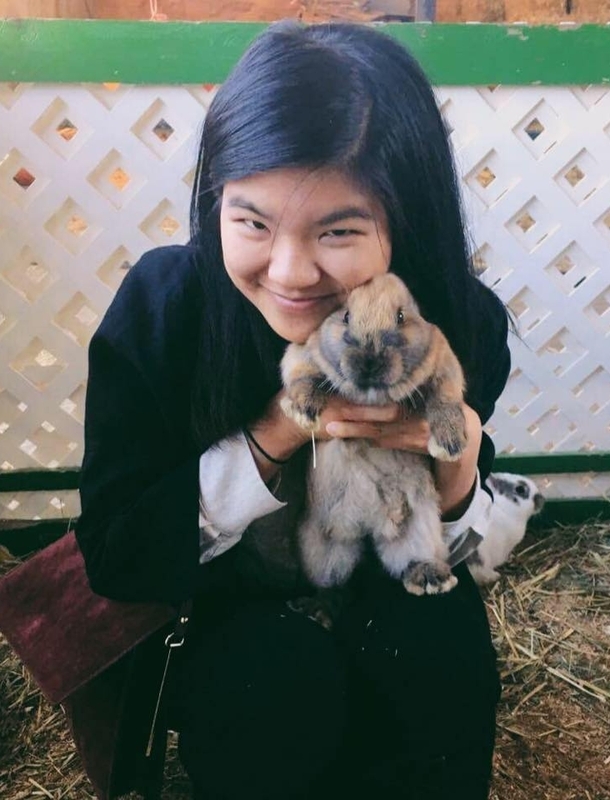 She also has an irrational love for cats (and buns - see the creature in her photo), so if you have a cat (or a bun), please contact her asap. I have always wished the verses were in a different order, a 1-2-3 list, with prayer first as it comes easier than being joyful – at least then I could check off #1. Digging in deeper, as it turns out, they are in a perfect circle, not a list at all. Inner joy that is not moveable by outside circumstances comes from the knowledge of our salvation, redemption, grace, eternal life, and Christ dwelling within me. It is not external – living up to the world’s standards; and it is not saying ‘no’ to sadness or pain, loneliness or struggles either. It is feet firmly cemented to the truth - we have an eternal home, an eternal Father, a Christ to consider, with hope eternal – its unshakeable, immoveable, and remains our inner joy-anchor when all else seems like whirling winds. With joy in place because of what Christ has done, ‘praying continually’ is next in line. The last few months I have been reading The Only Necessary Thing by Henri Nouwen. From it a little nugget of insight set me on an exercise these past few weeks of changing every thought into a prayer. Every thought into a prayer goes something like this: “I’m so tired today but have to go to work” transforms into “I may be feeling tired, Father but you give strength to the weary and I’m so blessed to have work to go to.” If every thought becomes a prayer because of what Christ has done for us and is continuing to do, the natural outflow is thanksgiving, the next command in the circle. Inner joy produces prayer, prayer produces thanks, which in turn solidifies joy – the circle complete. 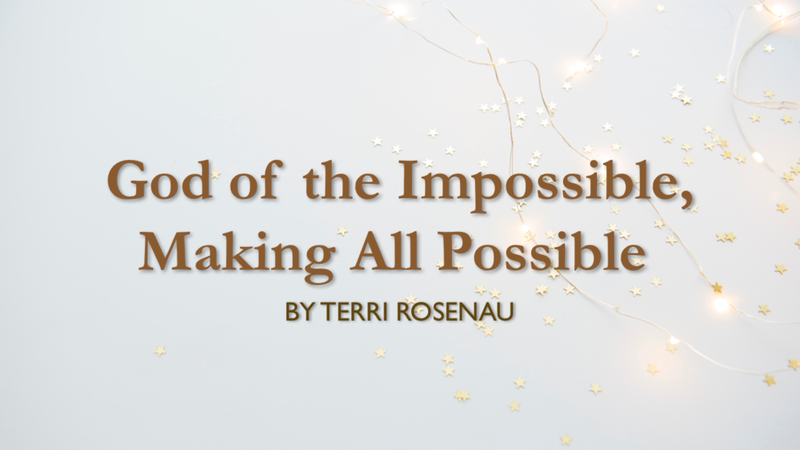 A list appearing all but impossible, now possible and the greatest part of all - it is God’s will for us. Have you ever wondered what God’s will was for your life? This is it – BEing joyful, BEing prayerful, and BEing thankful! LISTEN this Advent to His simple command, all laid out in ‘red and yellow, black and white’ – human form come down to dwell and live in us. Gratitude follows grace as thunder follows lighting. Terri is a mother to one, a sister to three, a friend to anyone who wants one, and a passionate lover of beauty. Her heart has two homelands – Vancouver and Uganda. She loves to cook and create. She’s a child of God and His Master's piece in progress. She lives under grace, with a grateful heart, but often with a dash of doubt and fear. To maintain healthy relationships, whether it be with people or God, communication must take place. As someone who studied counselling for four years I have found this to be especially true in all relationships. One of the major road blocks of communication is when one or both people forget to listen to the actual meaning behind the words being communicated*. It is incredibly easy to ‘half listen’ when someone is talking to you, as there are many distractions in the world today. Take for instance, my husband Josh. In our first month of marriage I said to him “I love you,” to which he responded, “No problem.” Josh heard me speak, however he did not grasp the meaning behind the words I said because he was distracted by a piece of technology. Something small like this has led to many laughs, however the consequences of misunderstanding due to a lack of active listening in a bigger scenario can cause tremendous damage in interpersonal relationships. Active listening is a skill used to help draw meaning out of the words being spoken and it helps to guard against distorted listening*. Despite my training, I sometimes neglect to actively listen to those around me because this skill requires hard work, focus, and discipline when seeking to grasp meaning. While this difficulty is present in interpersonal communication, the same difficulty applies when we are seeking to understand what God says to us in His Word. When we read Isaiah 61, are we actively seeking the meaning behind the text? These words written by Isaiah contains a message about all of the righteous gifts promised to us that will change the way we behave, which will ultimately bring glory to God. We see the words about the covenant and the salvation that God is promising. There is also an indication about righteousness and praise that will sprout throughout the nation. What covenant is coming? What will salvation look like? Why will there be righteousness and praise in the nation? Jesus aids us in finding the answer to these questions when He quotes Isaiah in Luke 4:17-21, expressing how this prophecy has been fulfilled by His coming! Jesus’ quotation of this passage in Luke illuminates the fact that Isaiah was in fact prophesying about Jesus. There is so much significance in this passage because of the birth, death and resurrection of the Lord Jesus Christ. We hear that there will be transformation in this world, good news will be brought to the poor, Christ will bind broken hearts and He will set the captives free—just to name a few things listed in Isaiah’s writing. This prophecy regarding the birth of our Saviour demonstrates the changes that can occur in the nation of Israel, and also in the lives of all of those who live out the righteousness of God by faith in Christ*. In other words, salvation will be brought to all those who believe! Hallelujah! requires an effort that fosters a more vibrant understanding of Christ, thus enhancing my relationship with God. Jesus teaches us in Luke 4 that this prophecy is regarding Himself, the Son of God the saviour of the world. In this season of Advent are you actively listening to the words Isaiah shares? Are you seeking to understand the meaning behind His words? The Skilled Helper A Problem-Management and Opportunity Development Approach to Helping, First Canadian ed, Toronto, ON: Nelson Education LTD.
Oswalt, J. N., (2003) The NIV Application Commentary: Isaiah, Grand Rapids, MI: Zondervan. Katrina Wilhelm first moved to Vancouver in August of 2015 from Ontario, in order for her husband Josh to pursue a master’s degree at Regent College. She has since fallen in love with this city and Redemption Church. She is passionate about all things food and nature, along with a special love for homemade French-Canadian cuisine and creation care. These passions most likely stem from her multicultural background; she is proud to consider herself French-Canadian, Italian, and Aboriginal. In her constant state of uncertainty about what she wants to be when she grows up, Katrina is content and enjoying her work as a nanny of three energetic girls in the Kitsilano neighbourhood. When I read this passage, I envision it as a timeline on a painted canvas stretched out across a distance so vast I cannot see its end. I picture myself walking ever so slowly along its length, softly drawing my hand along each bump of paint, experiencing every event as it unfolds under my fingertips like braille. When I come to the story of the Israelites and their years of living as slaves under an oppressive Egyptian rule I pause and remember God’s promise to Abram that after 400 years they would be freed. I try to imagine what it must have been like for each generation to pass on to the next, the promise of God that freedom would come someday. I wonder what “someday” must have felt like when generation after generation died and still they remained in slavery. How many were able to believe God’s words when the promise didn’t come in their lifetime? As in a looking at any painting, it is not enough to view the canvas so close that only the individual brush strokes are noticed. In limiting myself to this narrow perspective when I walk along God’s timeline, I could be left wondering about God’s faithfulness. I must step back from the reality of the details and allow for the perspective of the Master as it was intended to be seen. In this same way, the story of God and His creation from the very beginning, His plan for salvation, God’s masterpiece, is meant to be viewed as a whole. Advent is a time when we prepare for the birth of Jesus. It is a special season in the Christian calendar that is designed to quiet our hearts, slow our pace and experience the painting up close. As we do this, the nearness of God’s presence reminds us of a reality outside of ourselves and we are drawn into the wider story. As we make ready for Christmas, that joyful season where we posture ourselves in adoration toward the infant King, we remember that as Christ has come, He will also come again. We burst in gratitude for the gift of our Saviour’s birth, but we reflect on the brokenness of the world and our hearts also long for His return. Standing back from the details, we “see” that it is not only the story of Jesus’ birth, it is a promise that more of what He has said will come to completion. He promises that specific events will take place and we as His people, will walk into a new heaven and a new earth where righteousness dwells. This is a place in which we long to arrive. In the meantime, as active participants in God’s great story, He calls us to “live holy and Godly lives… and to make every effort to be found spotless, blameless and at peace with Him.” God has entrusted this world to our care. We must recognize our place in it, persevere with humility, grace and love, seeking to be the hands and feet of Jesus not just during the Christmas season, but every day until He returns. All of us are strokes in God’s timeline. His promises may not come to pass in our lifetime, but we must be steadfast in our faith, diligently doing the work He has prepared in advance for us to do, declaring we believe the truth that God is always faithful. Isaiah 40 is the moment God enters a narrative that was going one way and in doing so changes the tone and shape of it. In the previous chapter, Isaiah speaks a word of warning to King Hezekiah of pain and loss that is coming. Hezekiah entirely misses the meaning of what was spoken, which would later be the removal of the Israelites to Babylon generations later. Here, in chapter 40, enters comfort. The book of Isaiah has 66 chapters. When studying this book some years ago, I learned about the book of Isaiah as being reflective of the larger story arc of the Bible. The first 39 chapters being a cry for a coming Saviour (in parallel to the 39 books of the Old Testament) and the 27 chapters that follow to be full of the promise fulfilled (parallel to the 27 books of the New Testament). This moment then, is one of significance. Chapter 40 is the first piece of that second part. The call to “behold” (v.9, 10) found here is a call for attention to the good news, to the One who stands forever. These verses are ones I have come back to many times to be reminded of how quickly the word of God changes things. We need God to enter like this. For the Holy Spirit to come and speak “Comfort, comfort”; for Lord God to come in might (v.11); for Jesus to be born into a world not expecting His history-altering arrival. These verses in Isaiah chapter 40 speak of a God who is present, both in the promise being brought to that moment of time, but also in the prophecy of Jesus to come. He’s been planning on showing up for a long time, and He’s been present all along. Increase our faith Lord that you are with us in this season, a season in which we prepare to celebrate your intentional entry into the world as human.